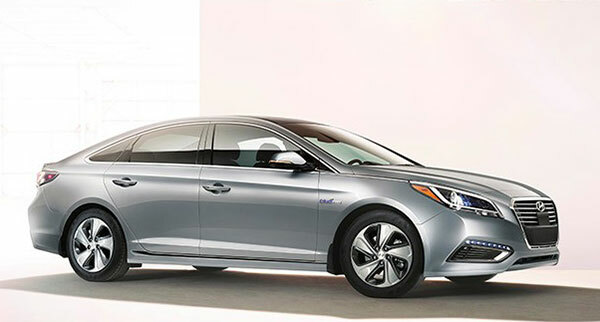 The 2016 Hyundai Sonata hybrid, based on the new, seventh generation of the mid-size sedan, promises 10-percent better fuel efficiency than the 2015 hybrid, while a new plug-in version can roll up to 22 miles on electricity alone. Introduced at the North American International Auto Show in Detroit, the 2016 Sonata Hybrid models go on sale this summer. The 2016 Hyundai Sonata gas/electric hybrids visually differentiate themselves from their conventional siblings with unique wheels and aerodynamic front and rear fascia that help them achieve an extremely slippery 0.24 drag coefficient. The heart of the 2016 Sonata Hybrid is a downsized 2.0-liter direct-injected four-cylinder engine paired with a 6-speed automatic transmission that houses (in place of a torque converter) a more powerful 38 kW electric motor and clutch. According to Hyundai, this Transmission-Mounted Electrical Device delivers both responsive performance and improved fuel economy thanks to its larger electric motor and enables the car to operate on electric power alone at speeds up to 75 mph by decoupling the gas engine from the rest of the drivetrain. The engine delivers 154 horsepower and 140 pound-feet of torque, the electric motor 38 kW (51 horsepower) and 151 pound-feet, for a net output from the system of 193 horsepower at 6000 rpm. EPA fuel economy ratings are expected to come in at 39 mpg city, 44 highway, 42 combined, the latter number up more than 10 percent over the 2015 model. Its 1.62 kWh lithium-ion battery pack fits under a newly flat trunk floor that leaves room for available 60/40 split-folding rear seats and 10 percent more trunk capacity than the 2015 hybrid at 13.3 cubic feet. The Sonata Plug-in Hybrid electric vehicle, Hyundai’s first PHEV, will carry a 9.8 kWh lithium ion battery pack, roughly five times larger than the Sonata Hybrid’s pack. The Sonata PHEV will provide an all-electric range of up to 22 miles. Its 50-kW electric motor is 32-percent more powerful than the regular hybrid’s to allow higher-speed EV operation. Its total system output is 202 horsepower at 6000 rpm, its expected EPA equivalent mpg rating (in EV mode) is 93 MPGe, and its expected (engine on) economy ratings are 38 mpg city, 43 highway, 40 combined. Sonata Plug-In Hybrid owners will be able to manage and monitor their cars remotely via an exclusive Blue Link smartphone app that will provide real-time data and perform specific commands like starting the engine, locking the doors and turning on the climate system. It can search Google for points of interest (using voice or text) and have those directions when starting their cars. Hyundai says its most useful feature will be managing its charging schedule (time and date) remotely via smartphone. All 2016 Sonata Hybrids will come standard with iPod/USB and auxiliary input jacks, SiriusXM satellite radio and Bluetooth phone connectivity with phonebook transfer and voice-recognition. Available upgrades will include an enhanced 8.0-inch navigation system with downloadable apps, HD radio and Infinity premium audio with next-generation Blue Link telematics, and nav-equipped models will support Pandora and SoundHound applications as well as Eyes Free Siri integration. Safety features will include seven airbags (including a new driver’s knee bag), Electronic Stability Control, Vehicle Stability Management, Traction Control, ABS, a rearview camera and Tire Pressure Monitoring with individual tire pressure display. Additional available safety and driver assistance features will include Forward Collision Warning, Blind Spot Detection with Rear Cross Traffic Alert, Blind Spot Detection, Lane Change Assist and Lane Departure Warning systems.